I, like many others all over the world, spent a week or so of my life in the summer of 2012 furiously turning the pages of Gillian Flynn’s bestselling novel Gone Girl. The story of a missing wife and suspect husband was a breath of fresh air, combining a degree of intelligence and great suspense without sacrificing the pulpy, sensational nature that makes books like these such fun to read in the first place. A film adaptation was inevitable, and two years later we have a David Fincher directed offering starring Ben Affleck and Rosamund Pike as the intriguing couple. With a somewhat dense literary narrative to bring to the big screen, I was interested to see if the filmmakers would be able to pull it off and bring a satisfying version of the engrossing tale to the cinema going masses. The real difficulty in reviewing the film as a stand along piece in my case is that I cannot really attest to the power of the filmmakers when it comes to the vital plot twists that the film so heavily hinges on. 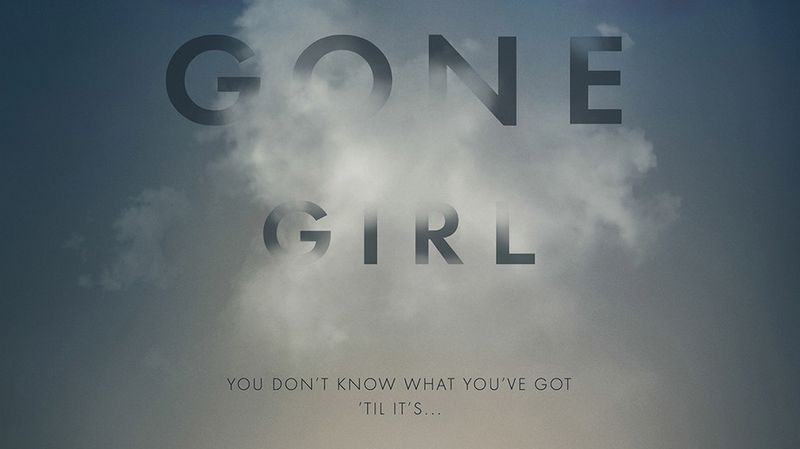 I suspect that Gone Girl will give two very different audience experiences to those who have read the novel and those who have not. 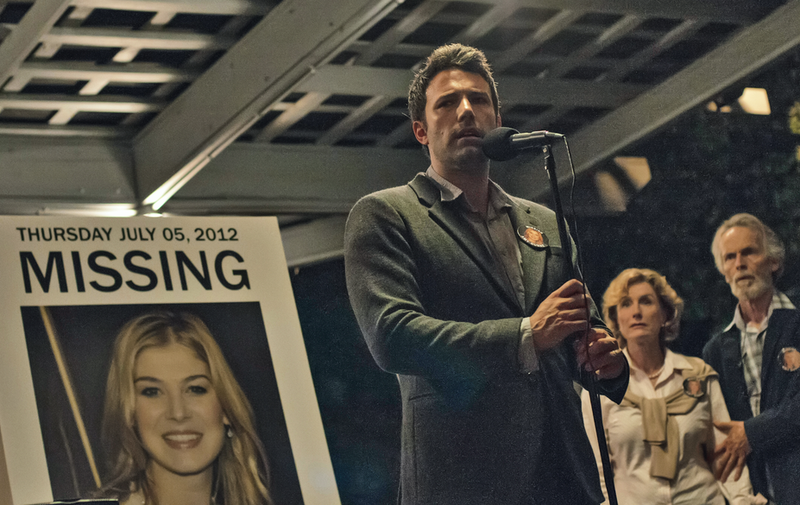 The story begins with Nick Dunne (Ben Affleck) discovering that his wife Amy (Rosamund Pike) has gone missing. The police soon become involved and certain discoveries are made that point to the fact that Nick may know more about Amy’s disappearance than he is letting on. The power of the story relies on the secretive intricacies of the plot so I shall say no more, but unfortunately, instead of immersing myself in the film I found myself constantly comparing key moments to my exciting and unspoiled experience with the book. The novel’s tag line is ‘there are two sides to every story’, and whilst both Nick and Amy’s perspectives do get shared in the film, one can’t help but feel that the novel gave a lot more room for plot development on either side of this story. Indeed, the main annoyance I kept having with the picture was that each new plot development was not given nearly enough time for the audience to really take it in and become involved with the discovery. The greatest pleasure of the book was being able to slowly uncover the twists and turns of the narrative, and the rushed nature of the film, though still being effective in providing satisfying plot points for the viewers, felt a little like Gone Girl ‘lite’ to me. However, trying to examine the film from a neutral perspective, it makes for a very impressive and innovative thriller with a series of twists that are sure to delight and shock any viewer going in cold. Though I would have liked a little more time spent on certain sequences, I can appreciate what an incredibly hard job it is to cut down fifteen hours worth of prose in to a two and half hour picture. A valiant effort, and though the film takes different paths to the novel at different times, the fact that Gillian Flynn herself has written the screenplay makes the transitions feel a lot more palatable, and the changes neither annoy the book readers too much nor leave the film viewers short changed. I was initially unsure of Ben Affleck’s casting as Nick, but he provides the perfect combination of sympathy, uncertainty and likability and unlikability in equal measure that are so vital to the character. Affleck possesses that certain kind of movie star presence that really fits with Nick as he is thrust in to the national media spotlight following Amy’s disappearance, and the degree of ‘acting within acting’ that takes place within the film is handled with great skill. To say anything about the characteristics and intricacies of Rosamund Pike’s performance would be giving too much away about the character of Amy, so I will avoid any detail and instead simply say that she is brilliant in the role. She fills the screen every time she is on it and completely steals the show, having made her way in a number of mostly supporting roles I expect to see her in many more leading roles in the future. Filling up the cast list with a handful of great supporting performances are Neil Patrick Harris, Carrie Coone and Tyler Perry. Yes, even Tyler Perry puts in an authentic and enjoyable performance! Ultimately, Gone Girl is a film that, like any big name novel adaptation, will always be in the difficult position of having to please two audiences who may be hoping to gain different things from the picture. Those literature purists who were hoping for a carbon copy of Gillian Flynn’s book may be left a smidgeon disappointed, but if you try to disregard your preconceptions then Gone Girl is an intelligent and fresh thriller full of shocks and turns that you will still be thinking about days after seeing it. It is a film that mixes the cerebral with the commercial and produces a film with a brain that also has blockbuster potential, a rarity in today’s industry. With a watch for Rosamund Pike’s performance alone but overall an incredibly enjoyable way to spend an afternoon or evening at the cinema, a film that has substance but also effortlessly caters to the popcorn brigade. Part of me wishes I could’ve come to the theatre without having read the book. I would love to know what my reactions to the reveals/twists would have been. I wish there had been more flashbacks on Nick’s POV. I think some more plot details or flashbacks would’ve made the twist weigh a lot more heavier. Working on my review soon…don’t know how I feel. I thought I would love the movie more than I did but I think my point of view is clouded/different from having read the book. I think that this could have been a run-of-the-mill mystery thriller………without Rosamund Pike’s participation. She is simply astonishing in this film and I think she deserves many awards. A knockout piece of work. Ms. Pike, take a bow! I completely agree with you. I’m really struggling to extricate my experience of the film from the book.